Online Legal Service for Overseas Pakistanis is ideal for those who have cases in Pakistan but are abroad/in another city. 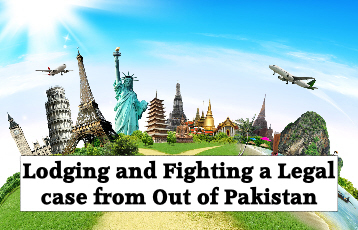 Litigation is an extremely stressful affair, even more so when you are not there in Person.We have trained specialist who deal with Overseas Pakistani Cases. We have already dealt with Several Clients who were/are in the UK, USA, UAE, Japan, Singapore and South Korea, whose legal matters in Lahore were dealt with, and they were fully aware of each and every aspect. We Cover Property Disputes, Marriages, Divorce Settlements, Child Adoption, Immigration Matters, Child Custody, Criminal Matters, Medical Negligence, Issuing FIR’s online, and other legal issues. Online Legal Service for Overseas Pakistanis means that we can file applications, submit cases, represent you in court, and can defend cases on your behalf. you are then informed of everything (via our Communications Officers) of the latest updates of your case, via Email / Whatsapp / Phone call 24 hours a Day. 7 Days a Week. 4) Expedite the process, to the best possible outcome. Our Lawyers also abide by our “24Justice.pk Fixed Fee Policy” which means you do not have to worry about any unknown and hidden extra charges.